Eric Stanley uses laser-cut paper layers to create these amazing 3D sculptures inspired by gothic and Islamic low relief windows. He got the idea when laser cutting Cheerios boxes for another project and he realized that he could create very complex and beautiful forms by stacking them together. 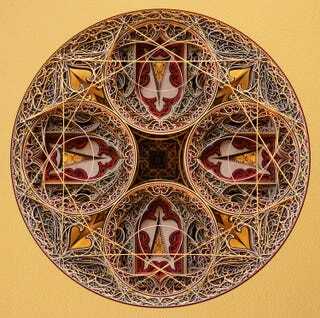 Eric Standley draws his themes from Islamic and Gothic architecture and art, formed in the 12th century. The technique he follows for the "building" of his works does not differ from that of the ancient craftsman other than he uses lasers in the place of the chisel and hammer. Eric's work consists of successive layers of intricately cut paper sheets utilizing a laser, thus creating a multifaceted, rich, colorful ensemble. The result is so complex and detailed that the works should be examined from multiple perspectives to be fully appreciated.